We provide affordable housing to help people live more independently. 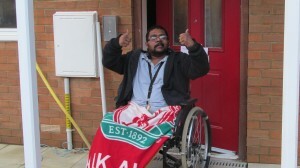 Much of our general housing is designed for people who use wheelchairs. The homes meet or exceed the standards set by the Wheelchair Housing Design Guide. We also provide specially designed or adapted ‘accessible’ homes for people who have mobility, sensory or learning difficulties. Some of these homes include technology to help with daily living. We have a small number of general needs homes – mostly on larger estates alongside specialist housing. We provide these homes so that we can help to balance the community. A handful of our homes are for shared ownership. They all meet wheelchair standards and are usually designed to meet the needs of a particular person. We provide different levels of supported housing. Some of the homes are built to wheelchair standards or are otherwise accessible. The care and support services are provided either by Ability Care & Support, or by other providers. Residential care – We have one residential care home for people needing a high level of personal care. Supported living – Tenants access support from staff on site and may get additional care and support to meet their individual needs. Short-term supported housing – Tenants are housed for a limited time, to support them while they develop independent living skills, before moving on. Move-on housing – This is for people moving on to live more independently, with or without continuing support.